Japan’s Fisheries Agency has revealed plans to replace its aging whaling ‘mothership’, the Nisshin Maru – flying in the face of both international opinion and a ruling exposing the charade of its supposed ‘scientific research’ whaling. The decision to commit $900,000 to a planning study under the Agency’s 2018 draft fiscal budget was taken despite the 30-year old global moratorium on commercial whaling. Conducted under the guise of scientific research, Japan annually lands thousands of tonnes of whale meat and blubber which is sold on the open market against the backdrop of a Government-endorsed scheme to bolster demand for whale meat, including through school lunches. The decision to replace the Nisshin Maru challenges not only the global ban on commercial whaling but also the International Court of Justice (ICJ) 2014 ruling which declared the Japanese whaling programme unfit for the purposes of scientific research. Operated by Japan’s Institute of Cetacean Research, the Nisshin Maru can hold more than 1,000 tonnes of whale meat in its freezer facilities – the equivalent of about 250 minke whales. 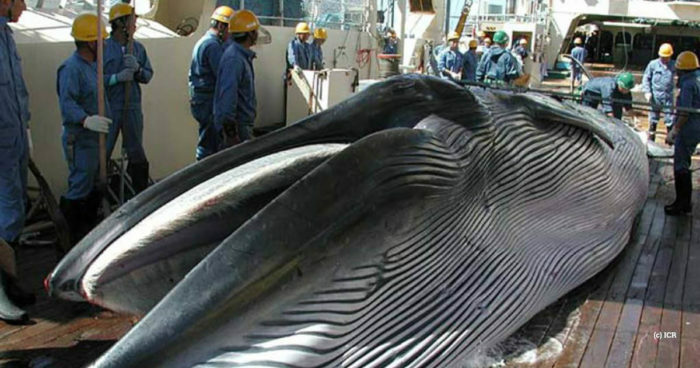 “Japan is laying its cards on the table by announcing plans for a new multi-million dollar mothership which, if built, could remain in operation for decades to come, killing thousands of protected whales,” said Clare Perry, EIA Ocean Campaign Leader. The announcement this week comes just months ahead of the 67th meeting of the International Whaling Commission (IWC), which takes place in September under Japanese chairmanship. For decades, Japan has used IWC meetings to challenge the whaling moratorium and fight proposals that seek to enhance the conservation status of whales, dolphins and porpoises. The meeting in Brazil will discuss a number of important issues including Aboriginal Subsistence Whaling quotas and a proposal to establish a major new whale sanctuary in the South Atlantic Ocean. Perry added: “Japan appears to be making major budgetary decisions based on the assumption that it will be successful in overturning the moratorium on commercial whaling. The stakes are high and anti-whaling countries are not doing enough to counter Japan’s refusal to abide by IWC rules.